Holy Crap! My wife had sinus issues many years back, had two different reaming-out surgeries, and at her doctor's direction started to use a sinus irrigation system that involved a special attachment to a Waterpik. I believe she just used tap water in it, but I might be wrong. She stopped using it after a year or two. Wily, I assume you're dissolving that powder in tap water? If so, you might want to re-think that! I am not sure just what is meant here by "sterile water" … I assume distilled water you buy in a jug would not qualify. I am guessing that boiled water also would not qualify, but I'm out of my depth here. But I echo your reaction … geez Louise! sterile and distilled are not the same. I think we are OK here because our water comes from wells in the ground and not from municipality that gets its water from lakes and streams. Hm, good point … we were on a well when my wife was irrigating her sinus, and are obviously on a well now. The article says the amoeba lives in warm soil and water, but our water sources are anything but warm. Whew. Still, a darn good thing to be aware of. And as I read the article, I had a question. How come the amoeba is dangerous if it enters via sinus irrigation, but not if it enters via drinking? Is there a path to the brain if it is inhaled, but not if it is ingested? Both paths involve common tracts in the throat. Keg, when used to flush the sinuses, the amoeba (if any) can find a warm place to live, multiply, and migrate to the brain in the sinuses which are right by the brain. When swallowed, the they go through the digestive tract and come in contact with the gastric acids in the stomach which can destroy them. The sinuses do not have this type of protection. In 2004 (I think this time), when my husband was in the UCH intensive care facility, there was a man down the hall with flesh eating bacteria in his shoulder. All the nurses and doctors would on protective covering when ever they went into his room. But still, I was kinda nervous about the bacteria and being so close. I think the poor man has his arm and shoulder removed to save his life. Some of the organisms that attach us humans are downright scary! Thanks, smtaw, that makes sense. 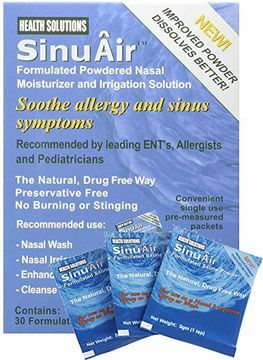 There is a wide variety of sterile saline products available for flushing eyes, sinus, wounds, etc. To my mind, it's a MUCH safer option than any neti pot type system.